From the complete failure of the Castor Project in Spain, to an overpriced hospital in Sweden, projects financed by the European Investment Bank (EIB) make no exception to the list of PPP disasters compiled in this new joint report. The report exposes how PPPs across the world drain the public purse, and fail to deliver in the public interest. 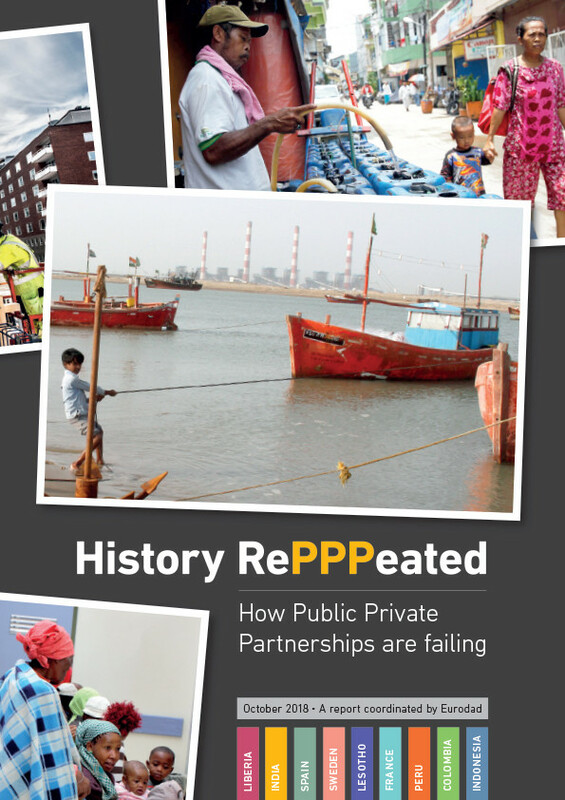 History RePPPeated: How public private partnerships are failing, launched on the occasion of the Annual Meetings of the IMF and World Bank, has been written by experts across four continents from organisations including Counter Balance. They expose the negative impacts of PPPs that have often caused misery to local communities. The report shows that multilateral development banks, such as the World Bank Group (WBG) and the EIB, have played a leading role in providing advice and finance for PPP projects in different sectors. This is despite the mounting evidence showing that PPPs are expensive, risky and opaque. The case studies include three projects financed directly or indirectly by the EIB. For example, the Castor Project in Spain – financed twice by the EIB – features among the PPPs that had to be cancelled due to evident failures, including on proper due diligence to identify the possible impacts of the project. Feted as Spain’s biggest offshore gas storage plant — the Castor project was halted after gas injections caused more than 1,000 earthquakes. Despite never being used, the plant has so far cost the public €3.28 billion, which is currently set to be paid through increased gas bills. To date the EIB never recognised publicly its responsibilities in this fiasco, despite criticisms from the European Parliament and from its own Complaints Mechanism. The EIB also financed a PPP failure in Sweden, where the construction of the Nya Karolinska Solna (NKS) hospital saw its cost rocket — from €1.4 billion to €2.4 billion — and was beset by technical failures. It is now known as the “most expensive hospital in the world”. Last but not least, by financing Bridge International Academies Ltd (BIA) through the Novastar equity fund, the EIB contributed to support a client involved in a controversial PPP educational project in Liberia. Indeed, the Liberian government outsourced the lion share of its public pre-primary and primary schools to BIA, but the process was not competitive, local communities were not properly consulted, and there was not full transparency. Access the full report including all case studies here. Since 2004 there has been a rapid growth in the amount of money invested in PPPs in the developing world. Although the trend has been volatile since 2012, efforts by multilateral development banks to leverage private finance in both emerging and low-income economies have continued — for example, through the “Cascade” approach developed by the WBG, whereby the use of private finance is prioritised over public or concessional finance. This report shows that many projects have been procured as PPPs simply to circumvent budget constraints and to postpone the recording of fiscal costs. Some accounting practices allow governments to keep the cost of the project and its contingent liabilities “off balance sheet”. This ends up exposing public finances to excessive fiscal risks.